v. : ill. ; 18 cm. The Preventive Maintenance Monthly is an official publication of the Army, providing information for all soldiers assigned to combat and combat duties. The magazine covers issues concerning maintenance, maintenance procedures and supply problems. 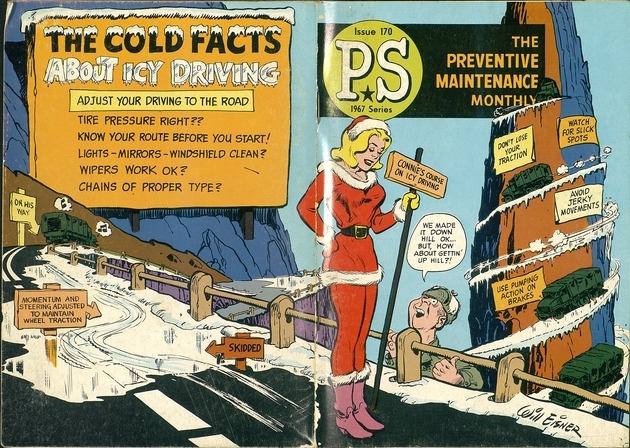 From 1951 until 1971, Will Eisner illustrated and co-wrote PS. Self-descriptive in purpose, featured a mix of illustrated articles, diagrams, and comics. Vols. for Dec. 1990-1991 distributed to depository libraries in microfiche. No. 61-<74> are photocopies (positive) copyrighted by Will Eisner Productions. Description based on: Issue 309 (Aug. 1978); title from cover. Sol Davidson Collection holds issues 36, 40, 44, 49, 85-6, 89, 108, 112, 142, 148-57, 164-71, 173-4, 177, 182-4, 186-96, 198-209. This item is a work of the U.S. federal government and not protected by copyright pursuant to 17 U.S.C. §105.